June 2009 – Fight Aging! Growing a bladder or a body part such as a blood vessel takes about six weeks. To create an artery, say, Atala plucks some of the immature cells that make up arterial lining and muscle from a sample of the patient's blood and incubates them by the billions in liquid nutrient. The cell-rich soup is then painted on a tube-shaped scaffold made from flexible collagen, like the tissue that forms the nose. (The collagen will gradually disintegrate once the vessel is in place.) The cells mature, multiply further, and form an artery. A small machine exercises the vessel, conditioning it to function normally after it is implanted. Building organs such as bladders and blood vessels, which have only a few different types of cells, has become almost routine for Atala's lab. A heart or pancreas is far more complex and challenging. This is the heroic story template in which the field of vision is narrowed (one might say dumbed) down to a single face, emblematic of thousands who are performing important work in the field. That's the way the popular press works, but remember that when journalists point out one groundbreaking fellow, there are dozens of others left unmentioned in the backdrop, folk with their own labs, important projects, and promising results. Tissue engineering is a large and very active field now, constrained far more by regulatory costs and barriers than by any technical hurdles. Given the present pace of development, I don't think it's unreasonable to expect a couple of different methods of producing organic replacements for all the major human organs (except for the brain of course) to be ready for use by 2020 - though whether they will be legally available in the US given the state of the FDA is another question entirely. The state of medical regulation is so far removed from sensible considerations of risk and readiness that countless potential therapies languish unused, undeveloped, and unrefined, along with whatever new information researchers might have learned from more widespread usage. Why do some mammal species live much longer than other, very similar mammal species? Here researchers look at resistance to biochemical damage: "Altered structure, and hence function, of cellular macromolecules caused by oxidation can contribute to loss of physiological function with age. Here, we tested whether the lifespan of bats, which generally live far longer than predicted by their size, could be explained by reduced protein damage relative to short-lived mice. We show significantly lower protein oxidation (carbonylation) in Mexican free-tailed bats (Tadarida brasiliensis) relative to mice, and a trend for lower oxidation in samples from cave myotis bats (Myotis velifer) relative to mice. Both species of bat show in vivo and in vitro resistance to protein oxidation under conditions of acute oxidative stress. These bat species also show low levels of protein ubiquitination in total protein lysates along with reduced proteasome activity, suggesting diminished protein damage and removal in bats. ... Together, these data suggest that long lifespan in some bat species might be regulated by very efficient maintenance of protein homeostasis." You might take a moment to compare this with research into naked mole rat biochemistry. Another benefit of regular exercise is proposed in this recent research: scientists "have, for the first time, been able to demonstrate that moderate exercise significantly increases the number of neural stem cells in the ageing brain. ... neuroscientists have known for some time that, in healthy brains, the creation of new neurons is an ongoing and lifelong mechanism. However, it has also been known for more than a decade that the number of new neurons we produce slowly declines with age. ... Investigating the mechanism by which neural stem cell numbers are altered will undoubtedly increase our understanding of how the brain responds to its environment. Ultimately, this should allow us to discover how to harness the brain's regenerative capacity, and to bring about new and effective treatments for conditions caused by trauma, disease, or even normal ageing. The brain's ability, even at an advanced age, to respond in a positive manner is very exciting as it extends the time-frame in which manipulation is possible." Genescient has a proprietary screen for substances that can extend human lifespan and healthspan. Using genetically selected long lived Drosophila and the latest genetic tools, Genescient has identified over 100 gene networks that are altered in long lived strains of Drosophila melanogaster and that are also linked to longevity and age-related diseases in humans. In essence, you might envision Genescient as what you get when you add very rapid progress in biotechnology (and falling cost in biotech tools) to the basic aims of Sirtris. Find longevity genes and manipulate their expression for benefit and profit in other words, but where Sirtris's initial development back before 2004 focused on just a few genetic networks, Genescient is aiming for "all of them." Even in five years, costs have fallen and tools improved significantly - think about the computer you were using in 2003, for example, and compare it to the machine you're using today. Like Sirtris, Genescient is firmly an outgrowth of the "work to slow down aging via metabolic and genetic manipulation" faction of aging research. They are not aiming to identify and repair biochemical damage, but rather shift the operation of human biochemistry into a more beneficial state for long-term operation. I'd insert the obligatory comment on how this approach is not the Strategies for Engineered Negligible Senescence, and even if wildly successful in decades to come will do little for those already old, but you're all probably all tired of hearing it by now. Reading between the lines ("nutrigenomic supplements? "), it looks like the Genescient founders might choose to monetize the results of their work in the supplement marketplace rather than take the Sirtris path of big pharma and the FDA. If that's the case, I couldn't say I blame them: you'd have to be extraordinarily dedicated - or foolish - to want to deal with the state of medical regulation in the US if there was a viable alternative option to make your investors happy. This is one of the reasons why the US research industry is basically doomed absent a revolution. That all said, the supplement industry is what it is; if you want to relegate yourself to irrelevance in the ongoing quest to cure aging, history suggests that entering the supplement market will achieve that end. Scylla on the one hand, Charybdis on the other - and going overseas to less oppressive regulatory regions in order to develop research into applications is looking ever more like the best option. Regardless, I think the most useful output for the long term arising from the work taking place at Genescient will likely be a wealth of data on how gene expression changes occurring with aging relate to forms of biochemical damage that are thought to cause aging. Are gene expression changes responses to damage, or are they genetic programs that themselves cause damage? Or both, or neither? How important is each particular change? These are vital questions if your goal is to revert gene expression changes in search of beneficial effects, but this data will also help those who seek to directly repair the damage itself. There's no such thing as useless information in biotechnology. Researchers continue to work towards identifying the exact molecular mechanisms by which autoimmune conditions like rheumatoid arthritis produce pain and damage: "When a microbe infects the body, the body responds by turning on a molecular switch to set the immune system into action and protect the body from disease. Today's findings show that a signal molecule called tenascin-C can trigger the same molecular switch and also activate the immune system. High levels of tenascin-C present in joints therefore may cause the activated immune system to attack the joint leading to the persistent inflammation of rheumatoid arthritis. The molecular switch is called TLR4, and is found on the surface of immune cells. Previous research has shown that mice without TLR4 do not show chronic joint inflammation. The researchers hope scientists can develop new treatments that target the interaction between tenascin-C and TLR4, which may help to combat rheumatoid arthritis. ... We hope our new findings can be used to develop new therapies that interfere with tenascin-C activation of the immune system and that these will reduce the painful inflammation that is a hallmark of this condition." Effective per-cell-type targeting of therapies is a fundamental and very important technology platform for the future of medicine. Here's another way of doing it, distinct from methods using viruses or nanoparticles: "The minicells are generated from mutant bacteria which, each time they divide, pinch off small bubbles of cell membrane. The minicells can be loaded with chemicals and coated with antibodies that direct them toward tumor cells. No tumor cell, so far as is known, produces a specific surface molecule for toxins to act on. But 80 percent of solid tumors have their cell surfaces studded with extra-large amounts of the receptor for a particular hormone, known as epidermal growth factor. The minicells can be coated with an antibody that recognizes this receptor, so they are more likely to attach themselves to tumors than to the normal cells of the body. The tumor cells engulf and destroy the minicells, a standard defense against bacteria, and in doing so are exposed to whatever cargo the minicells carry. ... treatment arrested tumor growth in mice implanted with either human colon or human breast tumors, and enabled mice with drug-resistant human uterine tumors to eliminate the tumors altogether." In case you have not yet heard or read, the Immortality Institute is providing a matching grant for research into laser ablation of lipofuscin. I am particularly interested to see the results of the worm lifespan studies to confirm whether or not lipofuscin is one of the key pieces of cellular junk affecting the aging process. The funding drive will continue through August 17th. Please consider saving up a couple dollars to donate to this research project. SENS Foundation is pleased to announce an initiative by the Immortality Institute, funding us in our fight against aging. The Institute will match every contribution up to $8,000 for the study of laser ablation of lipofuscin - research that will be conducted by Nason Schooler at the SENS Foundation Research Center. This ScienceDaily release gives some insight into how we might manipulate and repair our aging immune systems in the near future: "During their development in the thymus gland, a kind of 'T-cell school', every T-cell is fitted out with its own personal receptor. The diversity of these receptors allows the immune system to respond to nearly all pathogens. Since T-cell receptors are all randomly constructed, there is also a constant production of T-cells in the thymus that may recognize and attack the body's own structures. ... Most of these dangerous autoreactive T-cells, though, are sorted out in a screening process before they leave the thymus ... But not all autoreactive T-cells are driven to cell death. Some of them are 'reeducated' into so-called regulatory T-cells. While these still possess a T-cell receptor that targets the body's own structures, they have been reprogrammed during their development in the thymus so that they can no longer cause any damage. In fact, it is [quite the opposite]. ... They even keep other nearby errant T -cells under control. This is why the mechanisms for the creation of regulatory T-cells are of enormous practical interest. Deciphering these processes could lead to new therapeutic approaches for autoimmune diseases such as multiple sclerosis, rheumatic arthritis and type-1 diabetes, which are triggered by autoreactive T-cells." Being able to target very specific cell populations by their distinctive surface chemistry is fundamental to the next generation of medical technologies: "It is now possible to engineer tiny containers the size of a virus to deliver drugs and other materials with almost 100 percent efficiency to targeted cells in the bloodstream. ... We can introduce just about any drug or genetic material that can be encapsulated, and it is delivered to any circulating cells that are specifically targeted ... The technique involves filling the tiny lipid containers, or nanoscale capsules, with a molecular cargo and coating the capsules with adhesive proteins called selectins that specifically bind to target cells. A shunt coated with the capsules is then inserted between a vein and an artery. Much as burrs attach to clothing in a field, the selectin-coated capsules adhere to targeted cells in the bloodstream. ... [For example], metastasizing cancer cells circulating in the blood stream can stick to selectin-coated devices containing a second protein that programs cancer cells to self-destruct." As Michael Anissimov notes, the technological singularity as a concept seems to have wormed its way into the public eye to a greater degree than transhumanism as a concept has managed to date. There's probably a lesson or two in there somewhere. Are we going to see a very steep uptrend in new technologies enabled by biotechnology and computing power? If present exponential trends in the amount of data that can be organized and manipulated continue then we should expect such things as emulated minds, near-complete control over our biochemistry, and molecular manufacturing to exist in the 2040s. The nature of an exponential curve in progress is to produce surprise: growth looks linear for a while, and then all of a sudden an explosion of progress occurs. We'd all like to lazily find out that we're going to live for a long time in the future thanks to all the hard work being done by other people. For example, there's a contingent who argue that recursively self-improving artificial intelligences will basically allow us to solve all of our information-processing-related problems - the most interesting of which is controlling and repairing age-related damage in our own biology - and that the advent of such AIs within our lifetime is pretty much a given under present trends. Imagine a future where engineers build a computer with greater-than-human intelligence. This hyper-intelligent being expands its knowledge and brainpower exponentially over days and weeks as it learns how to improve on its own hardware and software design. It starts building 'offspring' even smarter than itself. The sudden arrival of these offspring - cheap, mass-produced super-intelligent machines - sparks explosive economic growth, triggering a series of cascading events. Nothing in the laws of physics prevents such an outcome, and the production of such artificial intelligences seems inevitable in the long term. But I've long thought that visions of the future allowed by the laws of physics and the nature of present growth curves in biotech and computing inspire a certain complacency in many people. The future will be great, it will bloom from nowhere when the curve takes off, and so no-one has to lift a finger to help now. Our collective fat will be pulled from the fire of aging by the deus ex machina we build. I'm dubious about large reductions in the length of business or research cycles through technology while humans are still in the loop. You can certainly make the process cheaper and better, meaning that more attempts at a given business or research model will operate in parallel, but there is a point past which the length of the business cycle cannot be easily compressed. That point is very much a function of the human element: meetings, fundraising, decisions, organizational friction, and so forth - all very time-consuming and proven very resistant to improvements in the time taken. Regulations don't help either - if you want to slow progress, ensure that the end results are not as reliable or effective as they could be, and make the product more expensive, you can't do better than regulation. My point here is that you shouldn't be dazzled. The future is far from certain, as it is still being built. The trends look very promising, but are by no means a guarantee that the applications of future technology actually built within our lifetimes will include the ones you and I desire. I'm sure we can all rattle off a list of large scale projects that have been possible for decades but never happened - colonizing the oceans, irrigating the Sahara, and so forth. The end of aging and radical life extension in particular will only happen if enough people understand that it can happen, and from that a large enough research and development community is generated to make it happen. Wishful thinking only works when someone, somewhere is getting the job done. For a field to move efficiently towards its end goal, there has to be some money-making application for early results and partial advances. Here's a look at early applications of work towards artificial bioengineered organs: "Our artificial organ systems are aimed at offering an alternative to animal experiments ... Particularly as humans and animals have different metabolisms. 30 per cent of all side effects come to light in clinical trials ... The special feature, in our liver model for example, is a functioning system of blood vessels. This creates a natural environment for cells. We don't build artificial blood vessels for this, but use existing ones - from a piece of pig's intestine. ... All of the pig cells are removed, but the blood vessels are preserved. Human cells are then seeded onto this structure - hepatocytes, which, as in the body, are responsible for transforming and breaking down drugs, and endothelial cells, which act as a barrier between blood and tissue cells. ... The researchers established that the cells work in a similar way to those in the body. They detoxify, break down drugs and build up proteins. These are important pre-conditions for drug tests or transplants, as the effect of a substance can change when transformed or broken down - many drugs are only metabolized into their therapeutic active form in the liver, while others can develop poisonous substances." I wanted to point out an example of research into the biochemistry of calorie restriction as an example of how scientists progress in their investigations of cellular biology. If the cell is a machine, then the biotechnology revolution has provided scientist-mechanics with wrenches to pull out cogs and screwdrivers to force the settings on inner switches. It has also bequeathed reams of disordered notes from a thousand other mechanics, and from all this sense and understanding has to eventually emerge. Carrano's next set of experiments focused on WWP-1's potential role in the regulation of lifespan. When she genetically engineered worms to overexpress WWP-1, well-fed worms lived on average 20 percent longer. Deleting PHA-4, which was discovered in Dillin's lab and so far is the only gene known to be essential for lifespan extension in response to diet restriction, abolished the life-extending effects of additional WWP-1 placing the ubiquitin ligase as a central rung on the same genetic ladder as PHA-4. Without WWP-1, cutting down on calories no longer staved off death. When a study by others found that UBC-18 interacts with WWP-1, Carrano wondered whether it could play a role in diet-restriction-induced longevity as well. She first confirmed that the UBC-18 functions as an ubiquitin-conjugating enzyme and gives WWP-1 a hand. She then tested whether it played a role in lifespan regulation. "Overexpression of UBC-18 was not enough to extend the lifespan of worms but depleting it negated the effects of caloric restriction," says Carrano, who is busy looking for potential substrates of the UBC-18-WWP-1 ubiquitination complex. Cogs, switches, and dials - and keep careful note of the results of each manipulation. That's the way it works behind the curtain. The processes of biochemistry common between most species are an enormous jigsaw puzzle, worked on by thousands of scientists and technicians. At the end of the road, there will be one or more ways to increase human life span by some amount through improving the metabolism of the next generation. People who live all their life with a better, human-engineered metabolism will reap the benefits, but I doubt these future methods will be of much benefit to people already old when development is complete. That will include most of us, I would imagine, given the likely timescales involved in research and development. Changing metabolism is fundamentally a way to slow aging, not reverse it. If you're already old, you're out of luck. This is one of the reasons I support work into repairing the damage of aging over work to manipulate metabolism so as to slow aging. By all means practice calorie restriction - it's free, available now, and the science backs the claim that it does great things for your long term health - but don't believe that deciphering the mechanisms of calorie restriction is the grand future of engineered longevity. It isn't. A true reversal of aging, and far greater healthy longevity are all plausible through other lines of research, however: don't work to merely slow the damage of aging, rather work to reverse and repair the known forms of damage. Much of medicine might be thought of, crudely, as the quest to control our cells - to influence their actions and alter their mechanisms to obtain beneficial results. Use of chemicals is the predominant methodology, but it's not the only path forward, as is illustrated here: "Many patients spontaneously recover some function in the weeks and months after suffering a stroke, as their brains reorganize to compensate for the damaged area. Scientists are searching for ways to both boost and focus this innate plasticity, thus improving neural repair. Electrical activity is one option under study: electrical current applied to the brain can modulate brain-cell activity - a crucial component of neural remodeling. ... A week after the start of the experiment, patients given the real treatment performed much better on a number of motor tests [than] those who received the fake treatment, improving by about 12 to 15 percent versus about 3 to 5 percent." This is analogous to early drug development: discovery by experiment, crude usage and small benefits. But we could envisage a line of science that made much more precise use of electromagnetic stimulation in concert with the new tools and knowledge of biotechnology. Would it be practical and competitive with other forms of medicine? Maybe, maybe not. But a great breadth of methodologies in research is the best sign that progress lies ahead. The weight of evidence indicates exercise to be beneficial to healthy longevity. This would be expected in most species for much the same evolutionary reasons that calorie restriction extends longevity in almost all species. But how do you test that? "Declining mobility is a major concern, as well as a major source of health care costs, among the elderly population. Lack of mobility is a primary cause of entry into managed care facilities, and a contributing factor to the frequency of damaging falls. Exercise-based therapies have shown great promise in sustaining mobility in elderly patients, as well as in rodent models. ... Here, we describe the first exercise-training paradigm in an invertebrate genetic model system. Flies are exercised by a mechanized platform, known as the Power Tower ... When young flies are subjected to a carefully controlled, ramped paradigm of exercise-training, they display significant reduction in age-related decline in mobility and cardiac performance. Fly lines with improved mitochondrial efficiency display some of the phenotypes observed in wild-type exercised flies. ... The development of an exercise-training model in Drosophila melanogaster opens the way to direct testing of single-gene based genetic therapies for improved mobility in aged animals, as well as unbiased genetic screens for loci involved in the changing response to exercise during aging." DORAISWAMY: The two biggest misconceptions are "It's just aging" and "It's untreatable, so we should just leave the person alone." Both of these misconceptions are remnants of an outdated view that hinders families from getting the best diagnosis and best care. They were also one of the main reasons I wanted to write this book. If you're middle aged now and keep yourself in good health, you probably don't have much to fear from Alzheimer's disease. The condition will be understood and cured before you get to the point at which it's a risk; that much seems a good bet given the level of funding and speed of progress in biotechnology these days. Along the way to curing Alzheimer's a great deal of very important information on the biochemistry and workings of the brain will be uncovered. One byproduct of today's intense research into neurobiochemistry and the inner workings of brain cells - much of it funded in the name of curing Alzheimer's - will be to take another step up the ladder on the way towards brain emulation and the ability to repair an age-damaged brain in situ. We'll need those capabilities if we wish to live far longer healthy lives than are presently possible, since the brain is the only organ we couldn't just replace as a matter of last resort in future years of far more advanced regenerative medicine. This open access paper uses historical data to argue that differences in human mitochondrial DNA (mtDNA) lead to differing health and longevity benefits in response to calorie restriction: "We chose to focus on haplogroup H, which is one of the more recent haplogroups, but also now the most prevalent European mtDNA haplogroup, and compare historical longevity in closely related haplogroup U individuals under extremes of caloric intake. ... The human population has undergone dramatic shifts in caloric intake during different time periods throughout the last 200 years. ... We see an expected general increase in longevity during the 20th century in both haplogroups. Before 1920 there is no significant difference between the longevity of individuals in haplogroup H and U. During the caloric restriction of the Great Depression, 1920-1940, haplogroup H shows significant increase in longevity compared to haplogroup U [with a] mean difference [of] 2.6 years." A very clever analysis; the researchers go on to use computer modeling to theorize on how a specific single nucleotide polymorphism difference between the haplogroups produces this longevity difference. While very interesting advances are taking place in stem cell laboratories, the immediate applications of stem cells to therapy largely involve transplants. So newly discovered sources of stem cells for transplant are likely to be employed for some years to come. Here, ScienceDaily notes the researchers have found "a new avenue for harvesting stem cells from a woman's placenta, or more specifically the discarded placentas of healthy newborns. The study also finds there are far more stem cells in placentas than in umbilical cord blood, and they can be safely extracted for transplantation. Furthermore, it is highly likely that placental stem cells, like umbilical cord blood and bone marrow stem cells, can be used to cure chronic blood-related disorders such as sickle cell disease, thalassemia, and leukemia. ... The greater supply of stem cells in placentas will likely increase the chance that an HLA (human leukocyte antigen) matched unit of stem cells engrafts, making stem cell transplants available to more people. The more stem cells, the bigger the chance of success." The skeletons or age-crippled crones who speak to youths in the forest: "That which you are, we once were. That which we are, you will one day be." The years rot the body and blacken the heart, such that in the end we are all only too glad to surrender to death. These and a hundred other similar phrases are easy to conjure. You don't have to be widely read to recognize their burden of meaning. They are shards of what has been the human condition for as long as there have been humans - the story of the fall and the golden age beforehand enacted in a single lifetime, over and over again. We were young, and then we were not, and then we suffered until we died. This human condition is so ingrained in our myths, our histories, and our culture that we live and breathe it every moment that we fail to think differently. We are all caged by our formative years in more ways than we'd like, and our formative years were those in which we learned to accept aging, suffering, and death as the way of things. It's only later that some few learn how to rebel against what the majority consider set in stone, never to be challenged. Which is a pity, given the many ridiculous and outlandish things we are brought up with. We dispose of certainties involving crocodiles in the backyard pond, fairies, and Father Christmas through diligent experiment and what passes for research in early years. But we keep a great many pieces of equally nonsensical baggage for much longer in life. I'm sure you could rattle off a list based on what makes you roll your eyes when observed in others. Better to look at your own closet, however. Housecleaning there is the only way you're going to become more sane than you are right now. Loss of muscle strength, speed and dexterity is a common consequence of aging, and a well-established risk factor for death, disability and dementia. Yet little is known about how and why motor decline occurs when it is not a symptom of disease. Now, researchers at Rush University Medical Center have found that, among the elderly, less frequent participation in social activities is associated with a more rapid decline in motor function. If you want to live a while longer, then you do the housekeeping that needs to be done. If you don't, then you let things moulder and the neglect adds up. I'd wager you could justify most of the longevity and health differences above in terms of levels of exercise, physiological effects on the immune system, and similar line items. But regardless I think it basically comes down to people who want to live versus people who have weighed the suffering and decided not. Don't judge them until you're there too. The real tragedy here is the bucolic acceptance of it all. Brought up as a cow, thinking cow thoughts, destined for a cow's fate. It could all be changed, if only X, or but Y. There are plenty of paths ahead upon which the suffering of aging could be turned back with a few decades of massed human effort and ingenuity. How long until the herd decides to take one of these paths in earnest? People should be free to do stupid things with their own property, including their own bodies. Similarly people should be free to persuade, catcall, and debate when dumb courses of action are undertaken by others. Here, the American Medical Association (AMA) reminds us of the present state of scientific knowledge on hormone therapies: "Despite the widespread promotion of hormones as anti-aging agents by for-profit Web sites, anti-aging clinics and compounding pharmacies, the scientific evidence to support these claims is lacking ... People want a fountain of youth, and it doesn't exist. You need to conduct trials which prove the efficacy and safety of these products as you would with any other medication." Though what the AMA (and FDA) regard as sufficient trials are in fact so onerous as to be destructive of progress, a regulatory burden that blocks useful innovations and dramatically raises the cost of others. When listening to organizations like the AMA, keep in mind that they operate as a guild - their goal is to maintain high barriers to entry to their professional space so as to keep prices high. Regardless of the politics here, a weight of evidence for hormone therapies just doesn't exist, however. Despite the loud "anti-aging" marketplace, these therapies remain proven useful only for a small range of rather unpleasant diseases. You'll find plenty of healthy debate in the aging research community: "Currently, the Oxidative Stress (or Free Radical) Theory of Aging is the most popular explanation of how aging occurs at the molecular level. While data from studies in invertebrates and rodents show a correlation between increased lifespan and resistance to oxidative stress (and in some cases reduced oxidative damage to macromolecules), direct evidence showing that alterations in oxidative damage/stress play a role in aging are limited ... Over the past eight years, our laboratory has conducted an exhaustive study on the effect of under- or overexpressing a large number and wide variety of genes coding for antioxidant enzymes. In this review, we present the survival data from these studies together. Because only one (the deletion of the Sod1 gene) of the 18 genetic manipulations we studied had an effect on lifespan, our data calls into serious question the hypothesis that alterations in oxidative damage/stress play a role in the longevity of mice." Or suggests that the antioxidant processes examined aren't particularly important to longevity. The best counterpoint to the paper's thesis I know of is the demonstrated use of mitochondrially targeted antioxidants to extend life span in mice. Mutations that cause a reduction in protein kinase A (PKA) activity have been shown to extend lifespan in yeast. Loss of function of mammalian RIIβ, a regulatory subunit of PKA expressed in brain and adipose tissue, results in mice that are lean and insulin sensitive. It was therefore hypothesized that RIIB null (RIIβ−/−) mice would express anti-aging phenotypes. We conducted lifespan studies using 40 mutant and 40 wild type (WT) littermates of equal gender numbers and found that both the median and maximum lifespans were significantly increased in mutant males compared to WT littermates. The median lifespan was increased from 884 days to 1005 days [and] the 80% lifespan (defined here as 80% deaths) was increased from 941 days to 1073 days. [There] was no difference in either median or 80% lifespan in female genotypes. Protein kinase A is related, via variants of adenosine monophosphate (AMP), to the mitochondrial biochemistry that produces the fuel biochemical ATP. A lot of important metabolic signaling and regulation centers around the processing of food into energy, and altering it can change life span in either direction. See the research into calorie restriction or insulin pathways for two areas of present intense scientific interest. Although the mechanisms for the extended lifespan are not yet known, the fact that it is observed only in males provides a uinique paradigm for further investigation of this interesting gene pathway. In this regard, we show preliminary evidence to suggest that the lifespan phenotype seen in the absence of RIIβ is directly associated with decreased body fat but not insulin sensitivity. This seems reasonable on the face of it. As you may recall, other researchers have demonstrated that you can increase mouse life span by removing visceral fat. The benefits to longevity were somewhat less than those produced by calorie restriction, but still significant. Excess fat tissue is linked to age-related disease and degeneration, increased chronic inflammation, and various other woes. It's not something you'd want to keep. Ouroboros likes the recent work on gene expression similarities between somatic cells and germ cells in longevity mutants: "both the germ line and soma are made of cells. How is it that the soma is mortal while the germ line is, for practical purposes, immortal? ... the germ line and soma are maintained in different ways, either in quality or extent. The germ line is doing something differently than the soma, the upshot of which is that the germ line is immortal. ... A strict interpreter of the theory would presume that this 'something' is resource-intensive, so that it wouldn’t be possible to apply the strategy to the soma. It's also possible, however, that it's simply inconsistent with optimal somatic functions ... [but researchers] have shown that in long-lived mutants of the worm C. elegans, somatic tissues start acting like germ line cells. ... Does the soma-to-germ line transition occur in other long-lived mutants, or in calorie restricted animals?" That would be an interesting discovery if it is the case. The two most plausible competing technologies for the tissue engineered growth of functional, complex organs from a patient's own cells are (a) decellularization of an existing organ to obtain its extracellular matrix scaffold, and (b) rapid prototyping of a new scaffold. From ScienceDaily: "Scaffold structures for tissue engineering that allow researchers to grow cells, whether skin, muscle, or even kidney, in a three-dimensional could allow medical science to create natural artificial organs. Such scaffolds are increasingly important for the future direction of regenerative medicine. However, conventional techniques have several limitations. In particular, current scaffold construction lacks full control of the often microscopic pores and their architecture. Tissue engineering usually involves cellular implantation. Cells might be derived from the patient or a donor. They are combined in the laboratory with a degradable scaffold that can then be implanted to replace damaged tissues. The presence of the structure scaffold also triggers the body to rebuild damaged tissue. ... researchers suggest that rapid prototyping overcomes many of the limitations of conventional scaffold techniques, such as stereolithography, which etches a block of material into shape. Rapid prototyping might one day allow kidney, liver and muscle tissues to be constructed in the laboratory from a patient's own cells with close-to-natural detail ready for transplantation." You'll find an interesting report on a recent meeting of members of the cryonics community at Depressed Metabolism. If you're not familiar with cryonics and its relevance to engineered longevity, you might want to read the introduction over at the Longevity Meme before going further - this discussion takes all the basic concepts for granted. John Dedon is the lawyer that Alcor has hired to create asset preservation trusts for Alcor Members. He said that only irrevocable trusts can be self-settled trusts (trusts where the donor and the beneficary are the same person) and that only 8 or 9 states allow irrevocable trusts. John was chosen to create the Alcor trust because of his considerable thought and experience with trusts for cryonics purposes. I would still favor South Dakota because (unlike Delaware) South Dakota has no state income tax. South Dakota has one of the longest histories as a state with no law against perpetuities. In my experience, trustee fees are less in South Dakota, and I suspect that the administrative costs associated with paying state taxes is part of the reason. I note that the cryonics community, rather like the diverse libertarian community, possesses a sizeable minority with a great (and I think misplaced) belief in the power of contracts - of words on paper. You see it in the constitutionalists in the US or the fellows looking for loopholes in tax laws that will enable them to escape the IRS entirely. Words on paper, however, have only as much weight as there are economic incentives aligned with them. I've discussed this before in the context of setting aside resources for a speculative future revival from cryosuspension via advanced medical technology. When you place your wealth with a trustholder, you have also given future representatives of that trustholder - and anyone else in a position to plunder or take advantage of the trust - an incentive to see that you are not revived. This is probably not all that important for a small trust held for only a few decades by a large and prideful organization, but the larger the collected mass of trusts and the more time that passes, the less likely it is that the original terms will be honored. Worse, under the scenario whereby cryonics becomes a large industry - and the practice of establishing asset preservation trusts becomes equally large - those folk being stored are collectively creating organizations that have as much of a financial incentive to use the political process to block revival efforts as they do to play nice so as to obtain new customers. Not to mention being a fat target for others to plunder via that same political process. (The cryonics providers themselves have the opposite incentives: they want to be seen to provide good service, so as to obtain new customers. They also want the customers who have paid a lump sum on suspension to be revived as soon as possible so as to free up resources for new customers. The former is much more important than the latter). My own assumptions on the likely time to revival - ignoring for a moment all the slings, arrows, and unknown odds between here and there - are based on revival only being likely when it is also cheap enough for small self-interested groups to undertake. If you look at historical development cycles for new technologies, and take note of where researchers presently are with biotechnology and nanotechnology, someone who is cryopreserved prior to 2020 might be waiting 60 years or more until the economic circumstances favor revival. That's a long time for any agreement to last absent the people who originally signed it, especially when money is sitting around untended. From MSNBC: "Scientists are genetically modifying a bizarre looking Mexican salamander [in] the hope its ability to regenerate body parts will one day help human amputees. ... It is a darling of researchers since it can regrow injured limbs, jaws, skin, organs and parts of its brain and spinal chord. ... Humans do repair tissue but they don't repair it perfectly whereas the axolotl under certain injury conditions can go into kind of a mode where they repeat the process of the embryo ... After amputation in salamanders, unlike in humans, blood vessels contract quickly and limit bleeding, skin cells work fast to cover the wound site and form what is called a 'blastema,' a collection of stemlike cells that will eventually become the new body part. ... "Now, as we watch a salamander grow back an arm, we are no longer quite as mystified by how it happens. Soon humans might be able to harness this truly awesome ability ourselves ... [Researchers] speculated it may be only be a decade or two until human parts can be regenerated, salamander-like." It is pleasant to see the ideas of engineered longevity springing up in diverse places, from folk far removed from the core of the present advocacy community. There's a little garbling of concepts in this piece, but overall the fact that it was written and published at all is a promising sign: "Aging is still a fatal disease. Can we prevent it, or even cure it? The aging process is a highly complex biogenetic phenomenon. Some pieces of this process we already know today: with increasing age we accumulate metabolic byproducts, which progressively damage the cell, especially the cell nucleus where all our genetic material resides in the chromosomes' DNA. But aging is no longer considered an immutable fundamental process for which 'nothing can be done.' Any process that hastens age-related decline in health and performance is a component of the aging process that deserves our attention and possible intervention ... Today, the primary aim of a life extension strategy is the application of currently available anti-aging methods in the hope that one lives long enough to benefit from advances in biogenetic sciences when the prevention and cure of aging becomes possible. Research bio-gerontologists project this to happen in about 20-25 years. We are only at the very beginning of performing cellular hygiene, which might potentially lead to the cure of aging." 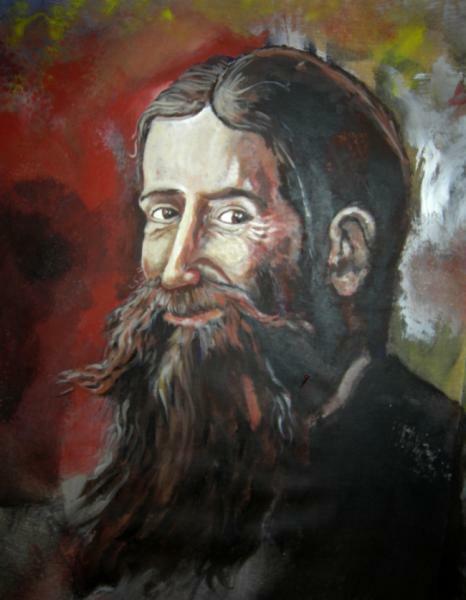 One of the fine folk at the Immortality Institute has painted a good-looking portrait of Aubrey de Grey, and is auctioning it at Ebay. The auction proceeds are presently planned to go towards the Institute's matching grant for laser ablation of lipofuscin. The Immortality Institute is excited to announce a new matching grant for anti-aging research. The Institute will match every contribution up to $8,000 for the study of laser ablation of lipofuscin - research that will be conducted by Nason Schooler [at] the SENS Foundation Research Center in Tempe Arizona. The science underlying the use of lasers to this end is explained in a presentation from the Understanding Aging conference archived at Future Current. In short: lipofuscin, a mix of metabolic byproducts and other compounds that our cells cannot easily break down, builds up in our cells with age. It causes recycling mechanisms to falter and cells to fail, and is one contribution to age-related degeneration. If researchers could get safely break down the dominant forms of lipofuscin, however, we could remove it every couple of decades and thus eliminate this one portion of aging. With this goal in mind, on the one hand you have the LysoSENS approach of searching for bacterial enzymes that will do the job, and on the other hand you have approaches such as the use of pulsed laser light to very selectively break down specific types of molecule without harming anything else nearby. One virtue of the laser approach is that it will be comparatively cheap to establish whether it is in fact useful in this case; perhaps a few tens of thousands of dollars. So if you've ever felt the urge to own artwork from the engineered longevity community, now is your chance to both obtain the art and help advance the science. The auction will run for the next ten days, so don't wait too long to decide. Advanced Cell Technology continue to push on towards a commercial therapy; it's certainly been a long road. "An experimental therapy using human embryonic stem cells to treat degenerative eye diseases has proved safe and effective in animal studies, and may begin early human trials in the next few months if it receives approval from the Food and Drug Administration. [The therapy] uses human embryonic stem cells to re-create a type of cell in the retina that supports the photoreceptors needed for vision. These cells, called retinal pigment epithelium (RPE), are often the first to die off in age-related macular degeneration and other eye diseases, which in turn leads to loss of vision ... . Although the transplants did restore visual function in the eye, the benefit was not always sustained over time in animals. ... these experimental therapies rely on the assumption that cells generated from embryonic stem cells will function like their normal counterparts. ... the cells may not represent an exact replacement ... Scientists won't know for sure until they see how the cells perform in clinical trials." Just as happened for the business of writing software, falling costs will turn biotechnology from a select priesthood into an endeavour undertaken by at all levels by all sorts of people. If we want rapid progress, then the broadest possible research community is what we'd like to see. Here's an h+ Magazine interview with one of the early adopters: "while one might envision dozens of isolated home biologists homebrewing genes in their basements and garages, there is a social aspect to this movement that goes beyond the online. Some people who lack the space to store large amounts of equipment have formed co-op labs where they work together. Meetings, arranged over the net, generally happen at people's homes and have a party vibe. ... Why has this field suddenly exploded? The answer goes far beyond falling costs and the rise of the garage tinkerer, although these are factors. One big factor seems to be a desire to solve some of today's major problems. Discussions seem to frequently drift towards two particular topics: creating fuel-generating microbes and finding remedies for disease. Indeed, the DIYbio community owes much of its increase in size to do-gooders, concerned citizens who see DIYbio as a method of confronting problems in a novel way. And while this is heartening, many members simply want to pursue science for the love of it. They're DIY simply because they wish to conduct research into relatively unprofitable fields." The trouble with research and development in biotechnology and applied life science knowledge is that it's ridiculously complicated. Here I am, ten years into the forest as an observer of one small part of the field, and its taken me this long to figure out how not to walk into the biggest trees or otherwise make a fool of myself. I'm still woefully underinformed compared to synthesist researchers, and I've paid close attention to but a fraction of what's going on out there. It's broad, ever-changing, and hard. Now consider this: in any rapidly changing field or research there are facts and there are claims, where a "fact" is just a claim with very solid backing. It can be difficult for an observer, such as a journalist, say, to tell the difference between facts and claims. You interview some guy, or you're reading a few popular reviews, and they present a variety of information. Some are good, some are bad, some have an agenda to push, and others are just wrong. Being published in a complex field is not a guarantee of correctness or of support for your thesis. If you're a journalist writing to a deadline for the normal pittance, and for an audience who know even less about the field than you do on average, then why take the effort needed to pick out fact from claim? It just doesn't pay anything back to your bottom line. This economic picture is why most popular publications on science are riddled with errors. They don't try to distinguish between fact and claim save where it's glaringly obvious, don't need to do so to in order to make money, and even an 80/20 effort would probably be prohibitively expensive for the return on investment. What prompted this line of thought was a recent online piece at h+ Magazine on life span, antioxidants, and in particular the antioxidant superoxide dismutase (SOD) that is generated in various forms within the body. Frankly the piece is a mess, and a very good example of the false impression of a field you can end up with when you don't take the time pick apart fact from claim. The article paints SOD as important to longevity. There is by no means a weight of evidence linking increased SOD with increased longevity between species, however, or even within a species. If you even superficially survey the literature you'll find examples of varied forms of SOD overexpression, underexpression, and deletion moving life span in either direction under various circumstances. "In humans and other mammals antioxidant enzyme levels normally decline with age and levels of inflammatory gene expression, like COX-2 and IL6, increase with age. ... drugs or supplements that create the effects of keeping S.O.D. and other antioxidant levels at youthful or higher levels are the only alternative [to calorie restriction] to these inevitable 'programmed' aspects of the aging process." Now to start with, a brief survey of the literature tells us that natural antioxidant levels do not uniformly decrease with age in mammals. Some types of SOD increase in some tissues in response to raised levels of oxidants and oxidative damage, for example, even as other types fall or level off. But even taking what is written at face value, the conclusion is a huge leap from known correlations (i.e. calorie restriction slows aging, and thus makes pretty much every biochemical measure tried to date look like that of a younger individual) to an assumed causation (less SOD is bad), and then again to an equally assumed single course of action (drugs and supplements). I'm all for speculation, and then testing on the basis of that speculation, but this is phrased as certainty. The article makes no mention of the issue of location in the cell. A cell consists of thousands of distinct components, and demonstrated extensions of healthy life span in mice via the application of additional antioxidants show that the location of those antioxidants within the cell is crucial: it has to be at the mitochondria. Every other strategy tried to date does nothing by comparison, or actually causes harm by interfering in the use of reactive oxygen species as signaling molecules. The article references Protandim as "shown in a published human clinical trial to raise S.O.D. levels." This is in fact a dubious interpretation of the trial data, pushed by the manufacturer for all the obvious reasons. Protandim is an excellent example of the sort of marketing and unproven product that makes it hard for people to talk seriously about developing longevity therapies. By way of comparison, in the Skulachev laboratory, Russian researchers have demonstrated a 20-30% extension of life in mice using their engineered antioxidant compound. I think it's safe to say that if your antioxidant therapy doesn't extend healthy life in animal studies, then you don't really have anything of interest. So in short, the article gets the basic science wrong, reads correlations as causations, misses the really interesting work that is taking place in this area of study (30% life extension through mitochondrially targeted antioxidant compounds or genetic engineering of catalase expression in mice), and points to dubious and dubiously marketed supplements as the future. There's no robust evidence for SOD supplementation, or indeed use of any presently available antioxidant supplement for longevity. On the other hand, there exists very solid evidence - in the form of mice living longer - for the Skulachev or Rabinovitch methods of using antioxidants specifically targeted to mitochondria. So overall not a good article at all; it's pretty much disinformation. You can do better than this, h+ staff. Even were there no further advances in cell-killing methods, the use of targeting nanoparticles to deliver existing cell-killing drugs would result in a great improvement in cancer therapies. Here, researchers "used a drug called Taxol for their cell culture studies [because] it is one of the most widely used chemotherapeutic drugs. Taxol normally causes many negative side effects because it travels throughout the body and damages healthy tissue as well as cancer cells. ... Taxol-carrying nanoparticles [are] modified so they carry the drug only to the cancer cells, allowing targeted cancer treatment without harming healthy cells. This is achieved by attaching a vitamin (folic acid) derivative that cancer cells like to consume in high amounts. Because the nanoparticles also carry a fluorescent dye and an iron oxide magnetic core, their locations within the cells and the body can be seen by optical imaging and magnetic resonance imaging (MRI). That allows a physician to see how the tumor is responding to the treatment. The nanoparticles also can be engineered without the drug and used as imaging (contrast) agents for cancer. If there is no cancer, the biodegradable nanoparticles will not bind to the tissue and will be eliminated by the liver. The iron oxide core will be utilized as regular iron in the body." How do you determine if a supposed longevity therapy is working in humans short of waiting for decades? This is why we need reliable biomarkers for biological rather than chronological age: measures of how much your body's systems have changed and degenerated from youth. From EurekAlert! : researchers have "found that as cells and tissues age, the expression of a key protein, called p16INK4a, dramatically increases in most mammalian organs. ... Because p16INK4a is a tumor suppressor protein, cancer researchers are interested in its role in cellular aging and cancer prevention. Now the team has proven that the same biomarker is present in human blood and is strongly correlated both with chronological age and with certain behaviors such as tobacco use and physical inactivity, which are known to accelerate the aging process. ... We found a very weak correlation between the biomarker and obesity - as measured by body mass index (BMI) - despite other data suggesting that caloric restriction slows aging. The data suggest the possibility that reduced exercise may actually be worse with regard to molecular age than a higher BMI." Bear in mind that there will be no one biomarker that gives an unbiased view of aging: a mammal is a very complex collection of interacting and very different system. Failing Memory and the Failing Immune System: Reversible? You might recall a Rejuvenation Research paper from last year that put forward evidence to suggest that some age-related mental deterioration stems from a declining immune system. Aging is often associated with a decline in hippocampus-dependent spatial memory. Here, we show that functional cell-mediated immunity is required for the maintenance of hippocampus-dependent spatial memory. As you probably know by now, our immune systems have not evolved for perpetual use. Their very structure and function results in an increasing level of disarray and malfunction with advancing age and usage. A failing immune system doesn't just mean greater vulnerability to pathogens, however. It also means damaging chronic inflammation, the accumulation of damaging senescent cells, and an increasing risk of cancer - all of which negatively impact life expectancy and the likely future of your health. The factors that determine brain aging remain a mystery. Do brain aging and memory loss reflect processes occurring only within the brain? Here, we present a novel view, linking aging of adaptive immunity to brain senescence and specifically to spatial memory deterioration. Inborn immune deficiency, in addition to sudden imposition of immune malfunction in young animals, results in cognitive impairment. As a corollary, immune restoration at adulthood or in the elderly results in a reversal of memory loss. These results, together with the known deterioration of adaptive immunity in the elderly, suggest that memory loss does not solely reflect chronological age; rather, it is an outcome of the gap between an increasing demand for maintenance (age-related risk-factor accumulation) and the reduced ability of the immune system to meet these needs. The immune system plays an important role in so many processes in the body. As researchers continue to document our biochemistry, it becomes increasingly evident that we need to develop the means to repair an age-damaged immune system. A few possible approaches have been discussed in the past here at Fight Aging! Other ways forward exist. It appears to be the case that great benefits to health and longevity could be realized if we could just reliably rejuvenate an old immune system, clearing out its errant programming and repairing its damage. Following up on a recent Alcor story, Aschwin de Wolf at Depressed Metabolism has some pointers: "There are various ways [risk of failure to obtain cryopreservation] can be minimized and we should start thinking about them. Most of all, cryonics members should execute living wills that rule out scenarios where greedy relatives will benefit from the patient not being cryopreserved. Furthermore, cryonics members should execute a Durable Power of Attorney for Health Care to ensure that the person who is authorized to make medical decisions on the cryonics member's behalf has a strong commitment to honoring this person's wish to be cryopreserved. This often will require giving this authority not to the person who is closest to you but to the person who is most knowledgeable and respectful of your cryonics arrangements (such as a long time friend with cryonics arrangements). Last, but not least, cryonics organizations should further expand their methods of determining high risk cases and improve communication with existing members. Although it is not possible, nor reasonable, to expect from cryonics organizations that they can avoid [a bad outcome] in every single case, there is an urgent need to beef up membership tracking and response capabilities." From the Methuselah Foundation Blog: "In the future we'll be able to harness nature's ability to form organs and build our own. ... Dr. Gabor Forgacs made that prediction. Now, he is making it a reality. Gabor is a University of Missouri researcher doing groundbreaking work in regenerative medicine. He is also the Scientific Founder and Chief Scientific Officer of Organovo, the latest company to receive support from you, the donors of the Methuselah Foundation. As we work to identify breakthrough technology that will help us reach our shared goal of extending healthy human life, Organovo stands out. Thanks to your contributions we are able to assist them as they apply their proprietary technology to 'print' new organs. ... Organ printing allows new tissue to replace diseased tissue. Since new tissue can be developed from cell sources from your own body, rejection of transplanted tissue is not an issue. The cells can be taken from youthful progenitor cells in your bone marrow to replace the older diseased cells. The cells ability to self-assemble means they will organize themselves into a functional tissue after being positioned." The biology of the cell is very, very complex. New important mechanisms and systems of regulation are still being discovered, and many of those already known remain incompletely understood. But every newly discovered system offers the possibility of ways to reign in cancer. Given that cancerous cells are normal cells run wild and mutant, overtaken by errant molecular machinery, we'd like to think that there are simple ways to bring it all crashing down - a single molecule that will be a spanner thrust into the works of cancer. Noticing the conspicuous absence of single-stranded genetic snippets called microRNAs in cancer cells, a team of researchers from Johns Hopkins and Nationwide Children's Hospital delivered these tiny regulators of genes to mice with liver cancer and found that tumor cells rapidly died while healthy cells remained unaffected. Researchers have shown that replacement of a single microRNA in mice with an extremely aggressive form of liver cancer can be enough to halt their disease. This is what I'd call solid engineering work. They don't know why this works, but proceeded to test on the basis of an observation and obtained a good result. Onward and upward: firstly you don't always need to know all the details of how things work in order to achieve great things, and secondly the march of biotechnology is making such speculative testing ever cheaper and thus ever more feasible. Restoring the microRNA most likely enables one of the many suicide switches present in our cells, a switch disabled by the specific mutations that led to that form of cancer. Systemic administration of this miRNA in a mouse model [results] in inhibition of cancer cell proliferation, induction of tumor-specific apoptosis, and dramatic protection from disease progression without toxicity. A viral vector was used to deliver the microRNA (or miRNA), but I wanted to draw attention to the fact that the microRNA was not targeted to specific cells; it's an example of a therapy introduced to every cell but that only harms cancerous cells. Ergo no side-effects, something we also see in many targeted therapies presently under development in the laboratory. Patients won't suffer due to their treatments under the next generation of cancer therapies, a great improvement over most present drugs and chemotherapies. Yet another view of Alzheimer's disease, this time as a consequence of increasing numbers of senescent microglia that no longer do their job of protecting brain cells: "In view of the recent work demonstrating presence of dystrophic (senescent) microglia in aged human brain, the purpose of this study was to investigate microglial cells in situ and at high resolution in the immediate vicinity of tau-positive structures in order to determine conclusively whether degenerating neuronal structures are associated with activated or with dystrophic microglia. ... We now report histopathological findings from 19 humans covering the spectrum from none to severe AD pathology, including patients with Down's syndrome, showing that degenerating neuronal structures positive for tau (neuropil threads, neurofibrillary tangles, neuritic plaques) are invariably colocalized with severely dystrophic [microglia] rather than with activated microglial cells. ... [The findings] support the idea that progressive, aging-related microglial degeneration and loss of microglial neuroprotection [contributes] to the onset of sporadic Alzheimer's disease." From ScienceNews: "Colorful locks depend on a group of special cells in hair follicles called melanocyte stem cells. Each of these cells divides into two cells: One that replaces itself and another that differentiates into a pigment-producing daughter cell called a melanocyte, which imbues hair with its browns, reds and blacks. Earlier research has suggested that the depletion of these stem cells was to blame for grayness. But how exactly these stem cells disappeared was mysterious. With no more stem cells around to produce melanocytes, hair turns gray. ... DNA damage causes them to lose their 'stemness,' the new report shows. Once the cells have racked up enough DNA damage, they become melanocytes and lose the ability to replace themselves or to replenish melanocyte cell populations. Once the melanocytes die, the hair is left with no pigment-producing cells." This should fuel the debate over the contribution of stochastic DNA damage to aging - perhaps diminishing stem cell populations is the important mechanism there. You might also compare this view of gray hair with the evidence for buildup of hydrogen peroxide as a cause. The material cost of performing tasks and procedures in biotechnology is falling in much the same way as is the cost of computing hardware, and for more or less the same reasons. We can see this most obviously in the plummeting cost of DNA sequencing, but it extends throughout the field. The most important benefit of this trend, to my eyes at least, is that it will lead to a robust garage biotechnology and applied research industry, skilled amateurs working to produce new technologies in medicine, collaborating and expanding in the same way as the open source movement in software. Perhaps not in the US, given the characteristic regulatory response of the FDA to anything new in medicine, but certainly in many regions in the world. Costs will fall to the point at which small groups of reasonably intelligent people can educate themselves and work to apply to humans metabolic, genetic, and other biotechnological manipulations developed in mice or primates. Consider myostatin knockout mutants and their muscles, for example. Or the mice with tinkered p53 and telomerase that live 50% longer. Or the mice with additional mitochondrially-targeted catalase that also live longer. Or the efforts by SENS Foundation funded researchers to move mitochondrial DNA into the nucleus and thereby remove that contribution to the aging process: that'll be done in the lab in a handful of years if all goes according to plan. There are many people who would - given the opportunity to proceed - carefully assess the risk / reward scenarios and use these technologies on themselves after they are proven in mice. There are others who would wait another decade for primate studies. But there exists a large pool of potential human volunteers willing to be one of the first to use potential longevity technologies or other improvements to our biology. So I believe that this will happen in many locations despite the likely outcome of regulators effectively outlawing such activities in the US and similar countries. There is no real technical obstacle to adapting these and many other strategies to human use over the next decade or so. The advent of completed mouse life span studies for some of the items I mentioned above, let us say a decade from now for the sake of argument, will coincide with a wide array of biotechnologies becoming cheap enough for part-time, educated amateur work. The comparatively small open and distributed biotech communities that presently exist will grow vastly in size and capabilities as costs fall - though again, perhaps not in countries like the US, where the urge is to lock people up for possessing children's chemistry sets, never mind personal gene therapy labs. But you can't stop economics. Lower costs and potentially great rewards for successfully applied medical technologies will ensure that diverse communities of developers spring up, and that they will work hard to bring new biotechnologies to human usage. They just won't do it in places where the authorities invest a lot of effort in shutting them down. I think that in the present environment of abitrary and oppressive regulation, this is the best way forward to see meaningful progress in our lifetime: escape and then ignore the regulators. Achievement is the best form of revenge. Work on what seems most promising. Take the personal, well-informed risks on new medicine that you feel are good. Don't let uncaring bureaucrats dictate the future of your access to medical technology, or the future of medical technology period. The future of medicine powered by advancing biotechnology will, I think, look much like the past of the open source movement powered by the fall in computing costs. With the difference that many (but not all) governments made it illegal to write your own code. That level of repression cannot last forever in the face of material results achieved by a distributed community of biohackers and regions that permit application of their work, however. The existence of myostatin knockout mutations suggests that we should expect to find as many beneficial single gene mutations in humans are have been discovered in mice. There are at least one or two humans walking around with a naturally occurring version of this mutation. Here's more research into the benefits: "Humans and animals with a mutation in the myostatin gene are extremely muscular and have little fat, past research shows. Also, when the gene encoding myostatin is knocked out in mice, their muscle mass increases. ... The researchers took mice that were genetically altered to develop atherosclerosis and then cross-bred them with myostatin knockout mice. Ten generations later, they had mice who were genetically predisposed to both atherosclerosis and inactivation of myostatin. ... All mice received a high-fat diet for 12 weeks, to spur the development of atherosclerosis. ... the mice with deleted myostatin gene had much less body fat and 30 percent lower fasting blood sugar and 80% lower fasting insulin levels, showing a reduction in obesity and a strong resistance to developing diabetes, the authors reported. They also had 50 percent lower low-density-lipoprotein ("bad") cholesterol and 30 to 60 percent lower levels of total cholesterol and triglycerides (fats in the blood), respectively. These results indicate protection against the development of atherosclerosis." It's never too late to gain significant health benefits from exercise - but that's no excuse to put it off, given the ongoing damage you'll do to yourself via years of a sedentary lifestyle. "It seems that the older we get, the less active we are. But why? According to the findings of a [recent study], the most powerful 'deterrent' among the over-65s is a lack of interest, and disbelief that exercise can enhance and/or lengthen life. It's what Bob Laventure [classifies] under the 'it's too bloody late for me' excuse. [But] studies show improvements in balance, strength, gait, muscular power, blood pressure, endurance and bone density as a result of regular physical activity in older age. For example, one study on 90-year-old women in a nursing home found that 12 weeks of strength training took the equivalent of 20 years off their thigh muscle age, resulting in improved walking and mobility. Another study found that six months of regular exercise increased VO2 max (a measure of aerobic fitness) by 30% in 60-70-year-olds. Exercise even helps you live longer - research from Harvard University found that men who burned 2,000 calories a week through exercise lived two-and-a-half years longer, on average, than sedentary men." This coming Monday, June 15th, is the deadline for discounted registration and abstract submission for the fourth Strategies for Engineered Negligible Senescence (SENS) conference, to be held at Queens' College, Cambridge, England on September 3rd-7th 2009. After the deadline, both student and standard registration fees rise by £150.00. Also, after that date, we cannot guarantee that submitted abstracts will be considered for oral presentation or that they will be included in the conference abstract book. The conference program features 45 confirmed speakers, all of them world leaders in their field. As with previous SENS conferences, the emphasis of this meeting is on "applied gerontology" - the design and implementation of biomedical interventions that may, jointly, constitute a comprehensive panel of rejuvenation therapies, sufficient to restore middle-aged or older laboratory animals (and, in due course, humans) to the physical and mental robustness of young adults. The core concept of SENS - fix or work around biological damage to reverse aging rather than manipulate metabolism to only slow the rate of damage and thus also slow aging - becomes increasingly important as researchers move ever closer to actually implementing the necessary technology. The SENS approach to mitochondrial damage and its contribution to aging, moving vital mitochondrial genes into the cell nucleus, is plausibly within a few years of technical implementation, for example. That means that a decade from now we may know exactly how great a benefit to longevity it produces in mouse studies. These are exciting times. Marisol Corral-Debrinski's Methuselah-funded group in Paris in [cracked] the problem of hydrophobicity of the proteins encoded by mitochondrial DNA. This obstacle, which had for over a decade completely stalled progress in the 20-year-old idea of making mitochondrial DNA redundant by duplicating it in the nucleus, is now largely solved, and there is great hope that this strand of SENS can be brought to complete fruition within only a few more years. An example of the sort of work presently taking place in cancer research laboratories: "A new lung cancer therapy employing a vaporized viral vector to deliver a cancer-inhibiting molecule directly to lung tissue shows early promise in mouse trials ... Aerosol delivery targets the lungs specifically and represents a noninvasive alternative for targeting genes to the lung ... [researchers] targeted the Akt signaling pathway, which has been shown to be an important regulator of cell proliferation and cancer progression. A recent report found that 90 percent of non-small cell lung carcinomas were associated with the activation of the Akt signaling pathway. They chose a lentiviral vector [known] for its ability to infect nondividing cells and effect persistent genetic changes. They transfected the lentiviral vector with a negative regulator of Akt signaling [which] would theoretically inhibit Akt signaling, thus suppressing cancer cell proliferation and tumor growth." This strategy produced material benefits in mice, albeit not quite as impressive as some other technology demonstrations of virally delivered therapies. The tenth Hourglass blog carnival is up: "As we age, we all suffer from some level of neurodegeneration, though in most cases this falls below the threshold of a clinical pathology. Slow chronic change isn't the only form of age-related brain damage: let's not forget about strokes, which can wipe out otherwise healthy neurons in macroscopic regions of the brain. While the risk factors for stroke and neurodegeneration are distinct, therapies might ultimately be quite similar - since in both cases, the goal is to regrow neurons to replace those that have been lost. At Brain Stimulant, Mike tell us about a clinical trial that will use stem cells to treat stroke ... Colin Farrelly of In Search of Enlightenment has submitted two long, thoughtful articles, the first about the clinical and social importance of tackling aging, the second about the cognitive biases that affect the way we think about risk and the significance of aging as a cause of mortality ... In a rational world, aging research would be at the forefront of a global collaborative initiative to improve the health and economic prospects of today's aging populations (and all future generations). But humans are not rational. We suffer many cognitive biases." Cryonics is important, and will become increasingly important if progress towards engineering longevity remains slow. Cryopreservation remains the only viable option that grants even a chance at greater longevity for those folk unlucky enough to die before the advent of radical life extension technologies. Which may include all of us, you never know. Worse has happened. An Arizona foundation is asking a court to disinter a Burlington man who died in February so his remains can be preserved through a low-temperature process known of cryonic suspension. Alcor Life Extension Foundation of Scottsdale, Ariz., wants to dig up the remains of 81-year-old Orville Martin Richardson. The foundation says in a lawsuit that Richardson paid more than $50,000 in 2004 for membership in the group and wrote in his will that he wanted his body delivered to the organization. "I further direct that, when and where possible, such delivery shall take place immediately after my legal death, without embalming or autopsy," Richardson wrote. He also gave Alcor full custody of his remains "for the purpose of placing them into cryonic suspension." Attorneys for Alcor contend that Richardson's brother and sister denied the foundation's request for his body and didn't notify them of their brother's death until months after he was buried. I can only imagine that the lawsuit is being undertaken as a point of principle and for the purposes of education: don't break contracts with Alcor or this will happen. After a few months of burial, I don't see that there will be anything left to preserve of the fine structure of the brain - it's too late for this poor fellow. Frankly, the behavior of the family looks pretty reprehensible if you want to go by the sparse details of the article (with the normal caveat of believing what journalists write only so far as you can throw it). Switching around a family member's post-mortem arrangements is little different from bullying and controlling folk who are too old and frail to defend themselves. In the case of acting to prevent cryopreservation that was organized and chosen by the deceased, it becomes something like fractional murder: removing that person's shot at whatever the unknown probability of future revival happens to be. This should serve as yet another cautionary tale for the rest of us. Thanks to government regulation you aren't permitted to organize your own cryopreservation under favourable terms prior to natural death. This is for all the same non-reasons that it remains largely illegal to provide assisted suicide services. (Who was it owns your life and body again? You? Not so much if you can't even decide the terms under which you'd like to end your life and dispose of your remains). You must wait for clinical death, and therefore be forced into frailty beforehand and relying on others to see the preservation through afterwards. Not to mention the suffering and cost of medical services that might otherwise have been avoided. Roll in the fact that death is all too often unexpected, this all leaves the completion of your wishes a matter of trust. So cryopreservation is harder than it has to be, largely thanks to all these issues of law and interference in personal choice. The lesson to learn from this is that a successful end of life transition into low temperature storage requires better preparation than perhaps you were putting into it to date. Senescent cells accumulate with age, a way to suppress cancer risk by shutting down damaged cells, but one that leads to all sorts of other biochemical damage. Here, researchers theorize that senescent cells lead to issues with the immune system and thus the age-related increase in risk of autoimmune disease. Compare this with the theory that issues with the immune system lead to an inability to destroy senescent cells, and thus their accumulation. As you can see many very fundamental and important issues of cause and effect in the aging body are still up for debate. "If the hypothesis is correct, the control of the formation, accumulation and elimination of senescent cells can be used to prevent and/or treat autoimmune diseases. The accumulation or removal of senescent cells would modify the microenvironment and therefore the immune reaction. Many other problems caused by immunosenescence can be also partially explained by our hypothesis. Basically, the accumulation of senescent cells is a finely regulated process. Every imbalance in the accumulation of senescent cells between the immune system and the potential target organs can initiate a chronic inflammation or autoimmunity." From Singularity Hub: "Why transplant an organ when you can grow yourself a new one? This research isn't something that might happen in the distant future. It's being used today to grow fresh organs, open up new ways to study disease and the immune system, and reduce the need for organ transplants. ... So how many different types of human organs have been grown and transplanted? The lab-grown bladders are among the only transplants of an entire organ, but a wide variety of partial organ transplants have taken place. Skin cells are regularly grown in culture and grafted onto patients' bodies. A graft was grown from a patient's trachea cells and transplanted to replace part of her airway that had degraded due to disease. Cartilage has been grown and transplanted into a patient's knee. ... Merely a decade ago, tissue engineering was still a new field that struggled to find funding and support. Today, thousands of scientists worldwide are coordinating efforts to reach new breakthroughs, and the demonstrated potential of these methods has helped bring in investors." That aging is understandable and solvable, not necessarily immediately but ultimately, was one topic not seeing a lot of opposition at the American Aging Association (AGE) conference in Phoenix AZ May 29 - June 1, 2009. Aging is not just a medical condition but a key challenge to be resolved for advanced societies to be successful in the long-term. Productivity, healthcare costs and happiness and comfort could all be improved with advances in the remedy of aging. Aging has advanced from a nebulous concept to concrete mechanisms that can be understood and managed. Which is very much the case. Within the scientific community, the debate is over how to achieve these ends, not whether or not to move forward. Of course, regulatory bodies such as the FDA still operate in the mode of "all that is not permitted is forbidden" and don't recognize treatment of aging as a valid form of therapy. Changing this state of affairs will be a long battle, probably best fought by moving all significant research, development, and clinical treatment away from the US until such time as the FDA collapses under its own weight. Bioremediation: Use natural enzymes to remediate biological build-ups; cholesterol oxidase from Brevibacteria to reduce 7KC cholesterol in atherosclerosis and A2E-degrading enzymes to improve macular degeneration. A future in which we're all pumped full of useful bacterial enzymes that clean up the mess our cells leave behind is a good future - and one that need not be very far off, from a technical point of view. The real hurdle is regulation, as ever, which delays potential therapies far past the point of sane and very beneficial risk-reward ratios, or worse, blocks them from ever being developed. An interesting line of thought via EurekAlert! : "In the sense that organisms existing today are connected through a chain of life - through their parents, grandparents and other ancestors - almost a billion years back to the first animals of the pre-Cambrian era, an animal's reproductive cells can be considered to be immortal. These germline cells generate their offspring's somatic cells - other cells involved in all aspects of growth, metabolism and behavior, which have a set lifespan – and new germline cells that continue on, generation after generation. [Researchers] have found that certain genetic mutations known to extend the lifespan of the C. elegans roundworm induce 'mortal' somatic cells to express some of the genes that allow the 'immortality' of reproductive germline cells. ... The idea that somatic cells can reacquire genetic pathways usually restricted to germline cells is fascinating, and since germline protection is seen across species, the activity of these genes may play a role in controlling mammalian lifespan. Understanding the mechanisms involved in this transformation could help us develop new ways to repair and even regenerate key cells and tissues." Some of the better known folk in the aging research community will be speaking at a conference held at Harvard this September: "Over the next 20 years, the population of Americans over age 65 is expected to double, and health care spending is projected to increase by 25%. With an aging society, it is crucial to understand the challenges and address the opportunities to target diseases of aging, such as cancer and type 2 diabetes, to allow people to live longer, healthier lives. The Aging and Healthy Lifespan Conference will address these timely issues. Hear leading experts discuss emerging research into scientific and medical advances in aging, as well as lifestyle and demographic trends. This first-ever conference will feature two speaker tracks. One track will focus on new research and insights in the science of aging, while the second track will feature emerging social trends in lifestyles, behaviors and activities of the aging population." I believe this is associated with the Alliance for Aging Research, and therefore much in line with the longevity dividend viewpoint. Why do organisms age? At the cellular and bacterial level, one can argue that aging is an inevitable evolved optimization that aims to carefully distribute biochemical damage to best ensure the continuing survival of a line of descent. But how and why did evolution favor aging in higher animals? Here's one line of thought: researchers "postulate that senescence could have evolved in order to prevent the spread of disease epidemics in populations ... Population density is a robust measure of fitness. But, paradoxically, the risk of lethal epidemics which can wipe out an entire population rises steeply with population density. We explore an evolutionary dynamic that pins population density at a threshold level, above which the transmissibility of disease rises to unacceptable levels. Population density can be held in check by general increases in mortality, by decreased fertility, or by senescence. We model each of these, and simulate selection among them. In our results, senescence is robustly selected over the other two mechanisms, and we argue that this faithfully mirrors the action of natural selection. This picture constitutes a mechanism by which senescence may be selected as a population-level adaptation in its own right." If you're in the habit of posting on the topic of aging science, then give some thought to submitting a recent post to the next Hourglass blog carnival: "The tenth installation of Hourglass, a monthly blog carnival devoted to the best blogging about biology of aging, will appear here at Ouroboros on Tuesday, June 9th ... Topics of posts should have something to do with the biology of aging, broadly speaking - including fundamental research in biogerontology, age-related disease, ideas about life extension technologies, your personal experience with calorie restriction, maybe even something about the sociological implications of increased longevity. Opinions expressed are not necessarily those of the management, so feel free to subvert the dominant paradigm. If in doubt, submit anyway. ... By the way, if you'd like to volunteer to host, please [contact Chris Patil at Ouroboros] - basically the rest of 2009 is wide open. If you've already hosted before, don’t let that hold you back; while the carnival is young, some repeat hosting is going to be par for the course." Accumulating Mitochondrial DNA Damage: More Harm or Less Repair? The mitochondrial free radical theory of aging tells us that accumulating damage to the DNA inside the mitochondria in our cells is a prominent cause of age-related degeneration. Mitochondria are powerplants, thousands to a cell swarming to turn food into the fuel chemical ATP, and their DNA, separate from the DNA in the cell's nucleus, is the blueprint for their assembly and operation. You'll find a simplified layman's explanation of the mitochondrial free radical theory of aging back in the Fight Aging! archives - there are a lot of steps and processes run awry between damaged mitochondrial DNA and the large-scale damage of aging. Damaged mitochondria proliferate in some cells and, like damaged factories, pollute those cell with excess reactive oxygen species (ROS) and free radicals produced as metabolic byproducts. Each damaged cell then tries to maintain itself by exporting more reactive oxygen species and free radicals from its cell membrane structures, spreading the damaging pollution far and wide in the body. We humans are self-repairing systems to some degree, as are the cells we are made up of. When considering an accumulation of damage in a self-repairing system, it isn't as simple as "dents and errors add up over time." Is the rate of damage changing? Is the damage causing a feedback loop that makes it more likely for more of the same damage to occur? Is the accumulation of damage actually a result of failing repair systems (i.e. ongoing damage is perfectly normal, expected, and repaired in a young individual, but some other aspect of aging causes the damage repair machinery to decline in effectiveness over the years)? The free radical theory of ageing states that ROS play a key role in age-related decrease in mitochondrial function via the damage of mitochondrial DNA (mtDNA), proteins and lipids. In the [fungus] Podospora anserina ageing is, as in other eukaryotes, associated with mtDNA instability and mitochondrial dysfunction. Part of the mtDNA instabilities may arise due to accumulation of ROS induced mtDNA lesions, which, as previously suggested for mammals, may be caused by an age-related decrease in base excision repair (BER). ... We report for the first time the presence of BER activities in P. anserina mitochondrial extracts. ... the increased mtDNA instability with age may be caused by decreased ability to repair mtDNA damage and hence contribute to ageing. Debating the exact method by which damage is happening may seem esoteric, but it does affect our expectations as to what sort of therapy would be most effective in rolling back the effects of mitochondrial DNA damage. For example, if the problem is largely a failing repair system, then a complete replacement of damaged mitochondrial DNA throughout the body - such as via protofection, demonstrated in mice four years ago - won't buy us as much time as we'd like. That new mitochondrial DNA is getting dumped into an environment that won't repairing it well, so it won't last as long. In this "failing self-repair" scenario, the SENS approach of moving specific crucial mitochondrial genes into the cell nucleus is much better. Do it once, and never have to worry about the problem again: it doesn't matter how ratty the mitochondrial DNA is getting because there's a backup in place that continues to provide the right blueprints. This is very illustrative of the philosophy behind the Strategies for Engineered Negligible Senescence (SENS): pick an approach that is as little affected as possible by present uncertainties in scientific knowledge. You'll notice that it matters little how and why mitochondrial DNA damage is happening, the nucleus backup strategy still fixes the problem for the long term. In many situations we won't always need stem cell transplants to build a regenerative therapy. In theory, with sufficient understanding, we could instruct existing stem cells in the body to do the job instead: researchers "have discovered a powerful new way to stimulate muscle regeneration, paving the way for new treatments for debilitating conditions such as muscular dystrophy. The research [shows] for the first time that a protein called Wnt7a increases the number of stem cells in muscle tissue, leading to accelerated growth and repair of skeletal muscle. ... This discovery shows us that by targeting stem cells to boost their numbers, we can improve the body's ability to repair muscle tissue ... the Wnt7a protein, when introduced into mouse muscle tissue, significantly increased the population of these satellite stem cells and fueled the regeneration process, creating bigger and stronger muscles. Muscle tissue mass was increased by nearly 20 per cent in the study. ... Our findings point the way to the development of new therapeutic treatment for muscular diseases such as muscular dystrophy, sarcopenia and muscle wasting conditions resulting from extended hospital stays and surgeries." From the Australian: "Three Australians have had their sight restored thanks to their own stem cells and ordinary contact lenses. Although the novel technique was used to reverse blinding corneal disease, it promises to be a quick, painless and cheap treatment for other visual disorders. It may even be useful for repairing damaged skin ... We're quietly excited. We don't know yet if (the correction) will remain stable, but if it does it's a wonderful technique ... two of the three patients were legally blind in the treated eye; they can now read big letters on the eye chart. The third could read the top few rows of the chart but is now able to pass the vision test for a driving license. ... the idea to team stem cells with contact lenses came from an observation [that] stem cells from the cornea, or front of the eye, stick to contact lenses. To obtain the stem cells, Dr Watson took less than a millimeter of tissue from the side of each patients' cornea [and] cultured stem cells from the tissue in extended wear contact lenses. Dr Watson then cleaned the surface of the patients' corneas and inserted the lenses. Within 10 to 14 days the stem cells began to attach to the cornea, replenishing damaged." The latest issue of h+ magazine is online, though you'll have to view it via a flash reader or as a PDF. The website itself puts out less ornately formatted articles on an ongoing basis as well. In tone and look, h+ magazine is somewhat like a merging of the old, adventurous iterations of Wired, transhumanist discussion lists, and the present Life Extension Magazine - it knows its demographic, for better or worse. One of the articles in this issue looks briefly at the work of Genescient in the context of manipulating metabolism and genes to slow aging. As the Boomers begin to go gray and fragile, those with way high expectations confront an uncomfortable fact - nobody has done much about aging, throughout their lifetimes ... and they get angry. How could this be?! Technology has carried us along on its broad back, giving us computers, conveniences, Internet and media wonders. But aches and pains foretell much bad news ahead. We can do better, but to do it we’ll have to reinvent biology. This is as good a distillation as you'll see of the spirit that drives the more active members of the pro-longevity mainstream of biogerontology. They work to build a better human metabolism, one small piece at a time: a biochemistry of life that will do less damage, and thus last longer. As usual, I should remind you that this vision looks like the slow and hard road from where I stand. There is an alternative: don't rework this incredibly complex system, but rather learn to reverse the fundamental forms of change and damage that cause it to fail. Build a better metabolism and it'll still fail in time. Learn to repair and restore the metabolism we have, and it'll last as long as you care to keep working on it. I believe that in the next few decades, we will unlock the secrets of human aging and we’ll be able to slow down, stop, and ultimately reverse aging. And that not an if, it’s a when. This manufacturing technology would build macroscale products atom-by-atom using bottom-up assembly, in contrast to the top-down assembly that represents almost all present-day manufacturing. Or imagine targeted anti-aging therapy and drug delivery. Nanoscale machines in the bloodstream can be used to target and repair cancer cells and other pathologies. Rob Frietas has written extensively on the medical applications of molecular nanotechnology and medical nanorobotics. All our problems of aging ultimately boil down to the wrong atoms and molecules in the wrong place and the wrong time. There is no known obstacle in the laws of physics that prevents us from developing and deploying billions of machines smaller than our cells to keep everything shipshape. In effect, stem cell therapies are our first stumbling steps in that direction, using the prefabricated machines we happen to have lying around and just barely understand. But we'll become much more adept in the years ahead. Xenotransplantion looks like a viable mid-term technology - after biotechnology can make animal transplants effective and very safe, but before biotechnology has advanced to the point of creating human organs from scratch. From the Times Online: "Scientists in China have successfully reprogrammed pig skin and bone marrow cells into an embryo-like state with the potential to form every type of body tissue. The achievement promises to provide a tool for breeding pigs that are genetically engineered to carry human immune system proteins so that their organs are less likely to be rejected for transplant. ... Pig pluripotent stem cells would be useful in a number of ways, such as precisely engineering transgenic animals for organ transplantation therapies. The pig species is significantly similar to humans in its form and function, and the organ dimensions are similar to human organs. We could use embryonic stem cells or induced stem cells to modify the immune-related genes in the pig to make the pig organ compatible to the human immune system. Then we could use these pigs as organ donors to provide organs for patients that won’t trigger an adverse reaction from the patient’s own immune system." We humans are driven by vanity. I'd give fair odds that tissue engineering of new hair will be widely available before tissue engineering of the simpler internal organs. Here's an example progress in this field: "Professor Lin Sung-jan took 10 hair follicles from rodents and cultivated 8 to 10 million dermal papilla cells in vitro in 20 days. Using aggregates of between 3 and 5 million dermal papilla cells, he mixed these with rodent skin cells and transplanted them onto bare rodent skin, which sprouted hair. ... Discovering that dermal papilla cells function to send signals and implement instructions, Lin developed biomaterial that can assemble and produce such cells. He also developed a bio-reaction device for use in mass-producing micro-tissues to induce hair follicle regeneration. Lin has also taken human hair follicles and conducted similar experiments, successfully growing hair on the skin of rodents. In future, he hopes to be able to control the size and color of hair grown." The idea that translation fidelity might play a role in aging dates back at least as far as 1963, when Leslie Orgel proposed the "error catastrophe" theory of aging: in this model, mistranslation of the translational machinery creates a feedback loop that leads to further translation errors, ultimately causing loss of cell viability. All the machinery in a cell is made of protein components, including the machinery that makes those protein components: DNA is first transcribed into RNA, which is then translated to make the protein specified by DNA. Errors in the translation portion of a self-replicating machine are not a good thing - who knows where you'll end up as flaws are introduced and cascade into more flaws. Error catastrophe was a nice theory while it lasted, but it doesn't in fact appear to be significant in mammals; we have exceptionally reliable genetic machinery. So good that across a lifetime you won't see anywhere near enough errors to kick off this runaway feedback catastrophe. The (largely settled, largely historical) debate over the error catastrophe theory bears more than a passing resemblance to the present debate over stochastic mutations in DNA itself. While there is a consensus that accumulating random DNA damage (mutations in single genes in single cells) leads to cancer, it is less certain as to its contribution to other aspects of aging. On the one side, there are researchers who think that DNA mutations scattered throughout your cells causes much of age-related degeneration and dysfunction, and on the other side are researchers who think that it isn't all that important outside of cancer. Like the error catastrophy theory, this debate is one that will be settled in the not too distant future through advancing biotechnology and good measurement. The error catastrophe theory is still an important waypoint in the evolution of theories of aging, and it has had tremendous influence in other areas within biogerontology. For example, similar logic has been applied to the role of autophagy in aging, where the feedback loop is called the garbage catastrophe. Cells have a lot of reasons to break down big molecules and structures into their component parts, and a lot of ways to do so. Unfortunately, one of the main reasons to break things down is because they have been chemically modified so that they no longer work, and sometimes these chemical modifications create structures that are so weird that none of the cell's degradation machinery works on them. This situation is very rare, but in the long run these modified chemicals add up. Ultimately the chemicals end up in the lysosome, a special vessel that contains the most powerful degradation machinery in the cell. If something can't be broken down there, it just stays there forever. This doesn't matter in cells that divide regularly, because division dilutes the junk enough that it remains at harmlessly low levels, but non-dividing cells gradually fill up with this stuff, making them dysfunctional. The heart, the back of the eye, some nerve cells (especially motor neurons) and, most of all, white blood cells trapped within the artery wall all suffer from this. Catastrophe theories are actually a good thing if proven. We want aging to work through feedback loops that run at low levels for a long time before accelerating at the end: this is the ideal sort of machinery in which to intervene. In LysoSENS for example, the plan is to safely break down the biochemical gunk that's clogging up the works via the introduction of bacterial enzymes. Provided you remove that part of the loop before things get very out of hand and cause dramatic damage elsewhere, you've effectively reset the clock. Damage to the elastin in the walls of our arteries is one of the ways in which we age: "Aging affects elastin, a key component of the arterial wall integrity and functionality. Elastin degradation in cerebral vessels is associated with cerebrovascular disease. ... The structural morphology of elastin changed [with age] from a fiber network oriented primarily in the circumferential direction to a more heterogeneously oriented fiber mesh ... Biomechanically, cerebral arteries stiffen with age ... Enzymatic degradation of elastin led [to] stiffening in the young group but did not affect the structural and material properties in the older group, suggesting that elastin, though present in equal quantities in the old group, becomes dysfunctional with aging. ... Elastin loses its functionality in cerebral arteries with aging, leading to stiffer less compliant arteries. The area fraction of elastin remained, however, fairly constant. The loss of functionality may thus be attributed to fragmentation and structural reorganization of elastin occurring with age." This has the look of the sort of damage done by accumulating senescent cells, which emit biochemicals that lead to errant remodeling of the surrounding extracellular matrix. The INDY longevity gene in flies looks like it works via reducing mitochondrial free radicals, amongst other items. Here's more evidence to show that calorie restriction (CR) triggers INDY, and there is at least some of the benefit gained: "The Drosophila gene Indy (for I'm not dead yet), involved in the transport and storage of Krebs cycle intermediates in tissues important in fly metabolism, was proposed to regulate life span via an effect on metabolism that could overlap with CR. In this study, we report that CR down regulates Indy mRNA expression, and that CR and the level of Indy expression interact to affect longevity. Optimal life span extension is seen when Indy expression is decreased between 25 and 75% of normal. Indy long-lived flies show several phenotypes that are shared by long-lived CR flies, including decreased insulin-like signaling, lipid storage, weight gain, and resistance to starvation as well as an increase in spontaneous physical activity. We conclude that Indy and CR interact to affect longevity and that a decrease in Indy may induce a CR-like status that confers life span extension." Significant Single Gene Longevity Mutations in Humans: What Are the Odds? Prior to the discovery of single genes that could be mutated, silenced, or otherwise altered to significantly extend longevity in lower animals, such a thing was thought very unlikely. Which is to say that nobody really thought about it at all - it wasn't a possibility within the paradigm of understanding for aging and metabolic processes. Now, of course, researchers have a variety of longevity mutations in hand in species ranging from worms to rodents, and more are being discovered with each passing year. Some technology demonstrations built atop these mutations have extended healthy life by as much as 50% in mammals (by combining a few methods), and far more than that in nematode worms. But I'm not an advocate of chasing metabolic manipulation as a primary method of enhancing human longevity. This is primarily because it will produce therapies that only slow aging, and are thus far less effective than a repair strategy aimed at reversing aging. Slowing aging does little for those already old, and is a one-shot deal. Repair methodologies help the old and can be used over and again. Beyond that one can also reasonably argue that the repair strategies will be less costly to develop given the present state of scientific knowledge. One has to regularly re-examine one's prejudices, however. The question for today is whether there exist as yet undiscovered and comparatively simple mutations in humans that will significantly extend healthy and maximum life spans. How likely is this, given what we know to date? Are potential human longevity mutations worth chasing? No human study can yet point to genetic differences that add up to more than a couple of years of life expectancy, and that's usually a matter of statistical analysis and/or resistance to one specific age-related disease. Single gene longevity mutations in other species were not thought plausible until discovered. Based on results obtained in calorie restriction studies, researchers don't expect metabolic changes to produce anywhere near as great an effect on longevity in humans as they do in mice. Much of the work on human longevity effects is inherently speculative; researchers are still striving to develop good tools that predict life expectancy or determine age in longer-lived animals. We humans are already an unusually long-lived species if you compare us with other mammals of similar size. That seems to bring with it a diminished return on metabolic changes with significant effects in lower animals. It's an open question as to whether that applies to changes that go beyond what the body is capable of itself in response to diet, and beyond the minor variations in human genotypes. Based on what I've seen over the past decade, I would not be surprised to see mouse life span doubled ten years from now through some ingenious combination of simple gene engineering and altered cellular processes - i.e. through slowing aging rather than repairing damage. Researchers are already half way there. Equally, I would not be surprised to see single human genes discovered that when manipulated or silenced can produce an expected change in life expectancy on a par with the expected changes for exercise and calorie restriction. This is to say something between a few years to an additional decade of healthy life, and an unknown effect on maximum life span. (Note that I say "expected" here. Even the figures for exercise based on demographic studies could be overturned with sufficient new data, and life expectancy predictions for human calorie restriction are just that - predictions). I would be very surprised if anything greater than that jumps out of a single gene mutation in humans. But my expected level of surprise is not a rigorous assessment. The rigorous assessment would be "probability unknown." There were all sorts of plausible evolutionary arguments as to why researchers wouldn't discover any simple change in an animal's genes that greatly improved its longevity - all wrong, obviously. Similarly, all it takes is one discovery in humans to make the present wisdom gained from calorie restriction studies and further evolutionary arguments wrong as well. Our present longevity is very much determined by evolution - look at how widely life spans vary between similar species - but that doesn't mean we yet fully understand why and how. So as research in lower mammals and other primates continues, scientists will increasingly build upon it to explore alterations in the human genome. But I don't see it as the best path forward to enhancing longevity for those of us reading this today. We will be decades older before any material benefit is realized - and that much less able to benefit from a technology that can only slow down aging. Our self interest is much more aligned with projects that could greatly improve health and longevity for the aged, and which could be realized in a similar time frame. Here is news of a technology demonstration that hints the future of medicine, "proving in principle that a human genetic disease can be cured using a combination of gene therapy and induced pluripotent stem (iPS) cell technology ... The hope in the field has always been that we'll be able to correct a disease genetically and then make iPS cells that differentiate into the type of tissue where the disease is manifested and bring it to clinic ... After taking hair or skin cells from patients with Fanconi anemia, the investigators corrected the defective gene in the patients' cells using gene therapy techniques ... They then successfully reprogrammed the repaired cells into induced pluripotent stem (iPS) cells ... Since bone marrow failure as a result of the progressive decline in the numbers of functional hematopoietic stem cells is the most prominent feature of Fanconi anemia, the researchers then tested whether patient-specific iPS cells could be used as a source for transplantable hematopoietic stem cells. They found that [the] cells readily differentiated into hematopoietic progenitor cells primed to differentiate into healthy blood cells. ... We haven't cured a human being, but we have cured a cell. In theory we could transplant it into a human and cure the disease." Ouroboros looks at a rare example of a treatment that extends life span but shortens healthspan in flies: "One of the central precepts of biogerontology is that meaningful lifespan extension will be concomitant with extension of the 'healthspan', i.e., the vigorous part of life - life that is, for lack of a better phrase, worth living. This relationship is borne out both in nature (where longer-lived organisms also have longer healthspans) and in the laboratory, where genetic and pharmaceutical manipulations increase longevity also increase the duration of healthy life ... Because of the importance of this assumption, we need to be on the lookout for counterexamples, such as the one provided by a recent study ... The authors show that lamotrigine, an anticonvulsant medication already shown to extend lifespan in the worm C. elegans, also has longevity benefits in the fly - but at an apparent cost to healthspan. ... the existence of exceptions to the general case underscores the importance of vetting each candidate longevity enhancement therapy for its effects on healthspan, before rushing into further development."